Note: The photos in this blog were taken a few years ago at one of my most memorable trapping jobs ever. I thought I'd share them with you now. There was no Sunday clinic today. As I mentioned before, I hate holidays. This was Labor Day weekend and there were no vets on 9/6 or 9/7. I thought of all the the cats needing help and I could do nothing. So I headed up North to do some volunteer archeology work with Bill. We do rock art documentation for the BLM. As volunteers, we've covered a lot of ground surveying for petroglyphs and documenting them for land mangers like the BLM and the Forest Service. It was hot and I was tired after a lot of hiking and actually was glad to not be trapping on Sunday night. I was back at it again on Monday night. A caregiver needed help with a large colony out in far west Phoenix. I knew this would mean a lot of driving but there were an estimated 15-20 cats needing to be fixed. As usual, there were more cats than expected. The 15 -20 cats turned into 32 cats trapped over a two night period. The first night I trapped 23 cats and ended up at two vet clinics once again. I took additional traps to the caregiver in the AM and then more later in the morning - more driving of course. I picked up the 23 cats at two vets for aftercare. The caregiver trapped the next night and caught nine more cats on her own overnight. Of course this was another person in need of financial assistance. 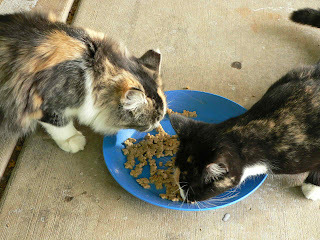 The biggest colonies are always in low-income areas fed by caregivers with no means to fix cats. 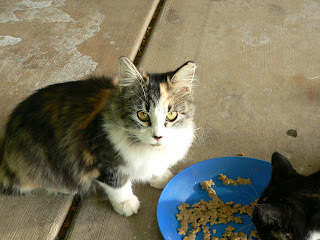 I picked up the nine cats in the AM and released the 23 from the day before. I had to leave dirty traps there as I had reached vehicle capacity. Before heading to the vet I stopped at Suzie's to help her transfer a cat into a trap. I had one space left in the Element. This was the mother cat that had been in a rabbit cage with the four kittens born in the trap at the vet's four weeks ago. There were six kittens to begin with but two had died as often happens with larger litters - especially when born under stressful conditions like in a trap. They were being weaned and it was time for mom to get fixed and go back to her colony. It was an easy transfer. Sometimes I think these mother cats are glad to be done with having kittens and want to get in the trap and get fixed! So I took ten cats to the vet today then picked them up later for aftercare. The kittens are doing well and fortunately the mother had been trapped by a rescue group and they are taking them for adoption. These kittens are lucky. That evening I had two smaller jobs. Both were for only two cats; however one job turned in to six cats over two nights. They were again in central Phoenix and close together. I only caught one at one location and left a trap overnight. I caught five cats at the other location and left a couple traps overnight. I'd trapped many times over the years at the latter location. The caregiver had called me and the mother cat had yet another litter (these are tame and in the house and still need to be fixed). She said, "I thought she could not get pregnant so soon after the previous litter". I responded, "Why didn't you call me?" It turned out that she did not want to fix a pregnant cat. Sometimes I feel like I take two steps forward and three steps back. Yet I will not give up. I checked traps in the early AM after my usual stop at Starbucks before 5:00 AM. What would I (and Suzie) do without Bucky's? I had caught the second cat at the one location overnight. Before going to the vet I released the mother cat back to her colony. No luck at the other location so the caregiver would try again on her own that night - one less trip to set traps. I dropped off seven cats at the vet and picked them up later in the day for aftercare. I then headed home to load up the nine cats trapped the second night at the west Phoenix job to release them back and pick up the empty traps. There was a stop at the gas station (again) on the way. I felt like I was in a holding pattern back and forth across town. Thank you XM radio for carrying news and talk radio. They keep me sane in my travels ranging from Queen Creek to Aguila and beyond - and Yuma in a couple of weeks (please stay tuned). Before I knew it, it was time to pick up the cats at the vet for aftercare. I released the two and five cats respectively back in the early AM. The one caregiver had caught the mother cat overnight so I took her to the vet and rushed home to check out traps. I guess I have not mentioned that most of our caregivers do their own trapping and transport and I am also a trap depot. People come and go from my place picking up traps where I train them how to do their own trapping. The SNH provides detailed written and verbal instructions for trapping. I also check out my drop trap to caregivers going for that one last cat they cannot catch. I only had one cat to pick up and she was ready early for pickup. I released her on Saturday morning, 9/12. I'd be checking out more traps on Saturday for the big monthly weekend clinic for ferals in north Phoenix that next day, 9/13. I had a trapping job that night for this clinic but I'll save that story for next week's blog. There were the usual calls and questions about the clinic -making sure everyone had their traps and knew where to go and when. We were hoping for 50 cats and 70 in Tempe on 9/13.